It was Sunday night at dinner time and I had no idea what to make. I didn't want to make a pizza from the freezer and the store was closed so I would have to use what was in the fridge. It also needed to be kid-friendly since D had accidently made the jalapeno burgers for lunch (an honest mistake, since all burgers look the same when they're frozen). Our troopers had eaten most of their lunches with the help of some milk and French fries but I thought they deserved something easy and just plain yummy for dinner. Melt the butter in a Dutch oven and sautee the onions and carrots for five minutes or until tender. Add the flour and stir to coat the vegetables, then add the broth. Bring broth to a boil, then turn down the heat and simmer until carrots are very tender. Remove the pan from the heat, add the milk and blend until smooth. Return soup to the pan and with the heat on medium and stirring constantly, gradually add the cheeses. Once all the cheese has melted, add the Worcestershire sauce, salt, and pepper. I served this with steamed broccoli and apple-chicken sausage but it would be good with lots of other add-ins too. For beer-cheese soup, substitute one cup of broth for one cup of dark beer. 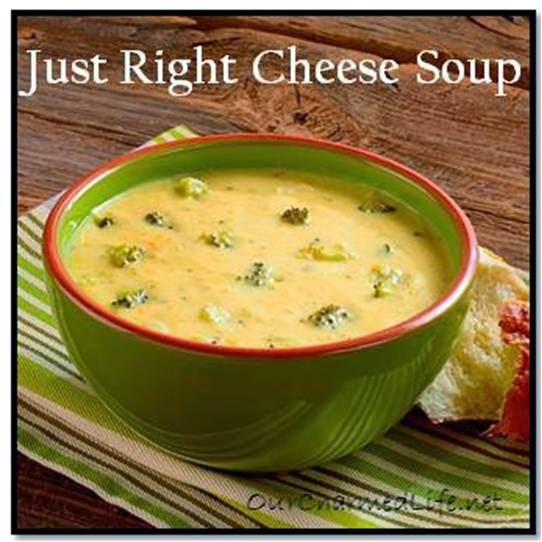 Do you have a favorite add-ins for cheese soup or any favorite recipes for it? Let me know if you make this one and how it turned out. Let me know what you come up with. The velveeta and mixed shredded cheese were all I had and they worked out just right but I think any cheese that melts smoothly would work... I hope you enjoy it! Oh this sounds delicious! I love the addition of Worcestershire sauce - I can't wait to try this! The Worcestershire sauce gives it just a little bit deeper flavor, but if you don't like it, you could always leave it out. I hope you enjoy the soup!